You are here: Home / Blog / Blog / Euphoria? For Whom? In my previous blog post, Partners in Exploitation, I discussed the various labeling schemes endorsed and promoted by HSUS, PETA, and other animal welfare corporations. And there was a coupon for “All Natural Brown Cow Parfaits,” which are apparently combinations of different flavors of yogurt. Yogurt? But doesn’t that involve animal suffering and death? 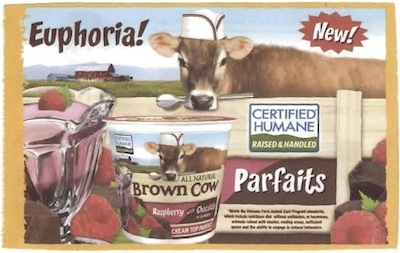 Please note that cow on the coupon is wearing a little service cap and holding a spoon in her mouth. So it’s all okay. You see, she’s willingly serving you this product, made from her suffering and death and the suffering and death of her children. And whose euphoria, whose sense of happiness or well being are we talking about? Perhaps the euphoria of Humane Farm Animal Care, which charges fees for its little stamp-of-approval? Perhaps the euphoria of HSUS, which promotes these “humane” products so that HSUS members and the public in general can feel warm and furry about eating the products of animal torture? Perhaps the euphoria of Whole Foods, who peddle “humane” animal flesh and “happy” animal products and make a fortune doing so? Perhaps the euphoria of PETA, who gives awards to places like Whole Foods so that it, like HSUS, can cash on the “happy meat” fundraising and encourage animal consumption? One thing of which we can be completely certain: It is not the euphoria of the cow. If you are not vegan, go vegan. It’s incredibly easy. It is better for your health. It is better for the planet, which sustains all life. And most importantly, it’s the morally right thing to do. http://www.abolitionistapproach.com/wp-content/uploads/2015/09/aa_logo.png 0 0 Gary L. Francione http://www.abolitionistapproach.com/wp-content/uploads/2015/09/aa_logo.png Gary L. Francione2010-03-17 12:58:242010-03-17 12:58:24Euphoria? For Whom?